As Isabella's first birthday quickly approaches we'd been thinking about what to do for it - a big party? A smaller family get together? A special family day out? etc. As her birthday is around when I properly return to work I wanted to us it as the perfect positive distraction, hence settling on having everyone who has been a part of Isabella's first year of life over to our house for a party. It's going to be a tight squeeze, but it just didn't seem right not to have everyone who cares for and loves Isabella here to celebrate. We then decided to go for a floral theme, mainly due to my love for everything floral - baby related or not! Also we already have a lot of floral 'things', such as her tipi, so it just made sense. Firstly we needed to sort out her party invitations, after all without anyone else it isn't going to be much of a party. 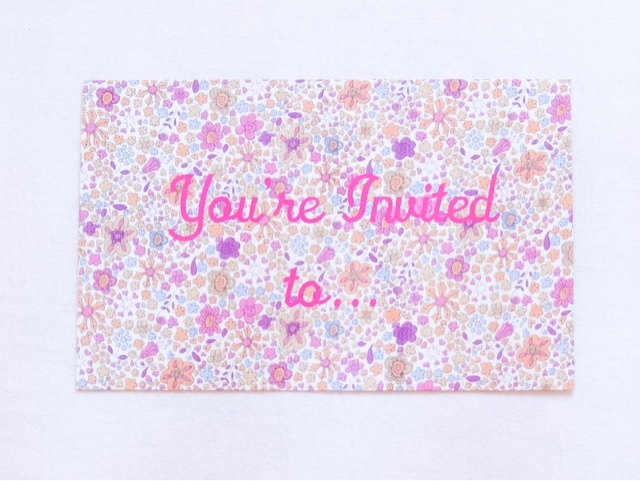 I searched for so long to find some floral party invitations, initially I wasn't looking for personalised ones and I couldn't find anything I liked. There were hardly any options and the only ones I liked (these or these if you're wandering) were almost £16 for 8, so I ruled them out based on price. We need around 20 invitations and wasn't prepared to pay more than £1 for each one. The problem I kept having was that the floral designs were often on wedding invitations, therefore doubling or tripling the cost! I eventually found these very pretty invitations for £1 each - convincing my husband that spending £20 on invitations was a bit of a challenge though. So we decided to have a go at creating our own on Vistaprint, a real team effort and we're so happy with the results. 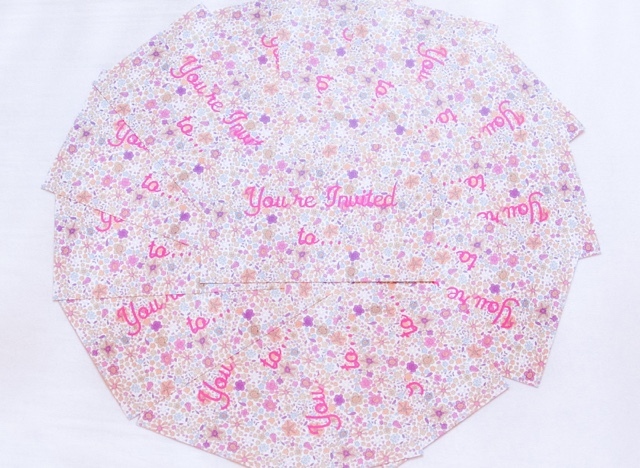 Originally I had tried to create my own invitation design in a Word document and print them onto card at home, but we found it so difficult to get it to print lined up on the back and front. Eventually we gave up and settled on using a printing service website. Using Vistaprint was so easy and we could create the whole invitation on their website. We opted for the 182mm x 117cm Flat Birthday Invitation with colour on both sides (otherwise the back in greyscale) and in a matte finish. Using a picture of some floral material we have as the main background. It did warn us that the quality wasn't quite up to their standards, but we took the risk and are pleased with the quality. There is room for improvement, however having the background very very slightly blurred actually made the writing stand out and worked perfectly! We then added pink text onto the front and purple text on the back, picking out the key colours in the background image. 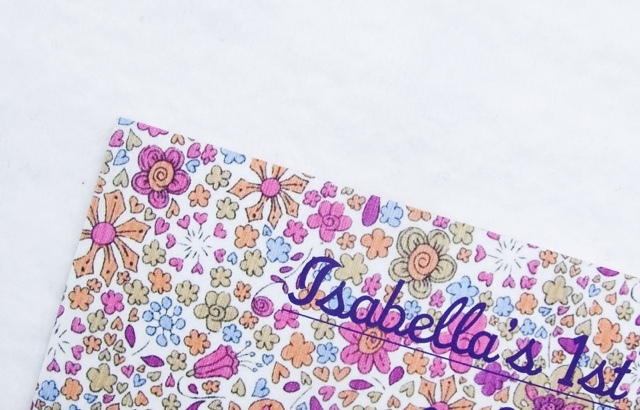 On the back we wrote the key details about Isabella's party: where, when, why, rsvp and contact details. The invitations from Vistaprint came with white envelopes, making it such a convenient service. It's the perfect opportunity to show your creative flair! You have to buy the invitations in sets of either 10, 20, 30, 40, 50 etc, which is a bit annoying if you want 11 but for the 20 we needed it only cost £13.92 - a saving of £6 compared to the £1 an invitation I had my eye on. It's also nice that we created them together, adding that personal touch. If you had a party for your little ones first birthday where did you get the party invitiations from?